Water is arguably the biggest problem in petroleum, bio-fuels, and petro/bio-fuel blends. Water freezes in all the wrong places at all the wrong times. Water corrodes, oxidizes, or otherwise destabilizes almost anything it touches (this is why water is called the universal solvent). 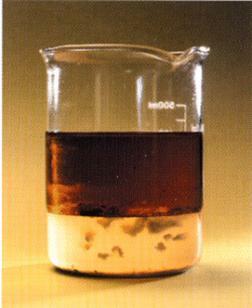 Water allows and encourages the growth of fungi and bacterium in all liquid petro/Bio-fuels. Water can seize, gall, swell, delaminate, dry-out, rot, various components, and if injected into the wrong place at the wrong time will shatter hardened metal parts. Petroleum and Bio-based fuels are hygroscopic, meaning they attract and hold water dissolved within the fuel. Diesel fuel can hold .1%, bio-diesel up to 1%; some other petroleum based lubricants can hold 7-8%. In practical terms all fuel has some water in it, and during storage and use, virtually all storage systems generate some water. This water in its dissolved state can still freeze, corrode, rot, e.g. It can cause fuel that is otherwise good for winter use to freeze, it can corrode a fuel injector to the point it will seize in place, and it certainly will growth bacteria. Water gets in during refining, during pipeline transportation water is sometimes used to separate different product, it can also get in the barges, train cars, and trucks used to deliver it. However the two main places it gets into fuel is during storage and in fuel tank of the piece of equipment where it is actually used. In storage tanks fuel is heated by the sun expanding its volume. This in turn forces air out of tank vent. When the sun goes down and the fuel cools it contracts or shrinks creating a vacuum drawing air in through the tank vent. This incoming air carries with it water vapor and bacterial and fungal spores. When the sun comes up and again heats the tank the water vapor is condensed and the water falls to the bottom of the tank. The spores begin growing and eating the fuel. As hey grow and eat the fuel their waste products act to breakdown or destabilize the fuel. The second main way that water is generated is through the fuel recirculation process that most diesel engines use. In this process the fuel is pumped from the tank through the pump and injection system where it is heated to 160°F - 220°F and then returned to the fuel tank. This adding of hot fuel back into relatively cooler fuel again causes condensation. Depending on the size and type of engine and the location of the fuel tank and other fuel system components it is possible to generate several ounces of water per hour. In many systems most this heated water vapor escapes out the tank venting system, however not all escapes, and over time it can build up until it causes either a fuel, fuel system, filter, and or engine problem. Water in fuel does more engine damage than all other fuel problems combined. While water problems are most commonly seen in diesel and biodiesel fuels, you can see similar problems in gasoline, especially where ethanol is added. Energy Technology Group Products offers several products that use a proprietary chemical combination that chemically binds with water and fuel to produce a completely burnable and safe fuel product. Using "Hydrogen Polar Bonding" this product Totally Disperses Water. Pinnacle Fuel Supplement, EcoFuel, EcoFuel with Lubricity, Injector-R-Clean all use this water dispersion technology.